The draft engine has been tested most in Google Chrome and we recommend it for the best experience. Please give the app a moment to show up -- there are a LOT of countries / sports / athletes to load! After your commissioner has scheduled a draft, there will be a link available on your league page a couple hours before the scheduled time. Along the top is the draft order, your team will be highlighted in yellow (we're viewing the "Team 1" team's screen here). Your roster is along the right side, and you can switch to view the other rosters with the dropdown. 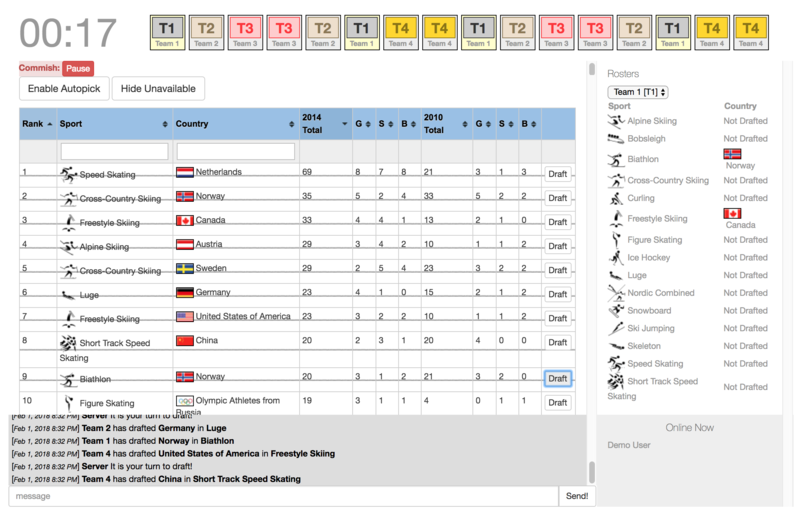 The main action is in the main draft window with all of the sports in your league, all of the countries, and medal totals from 2010 and 2014. 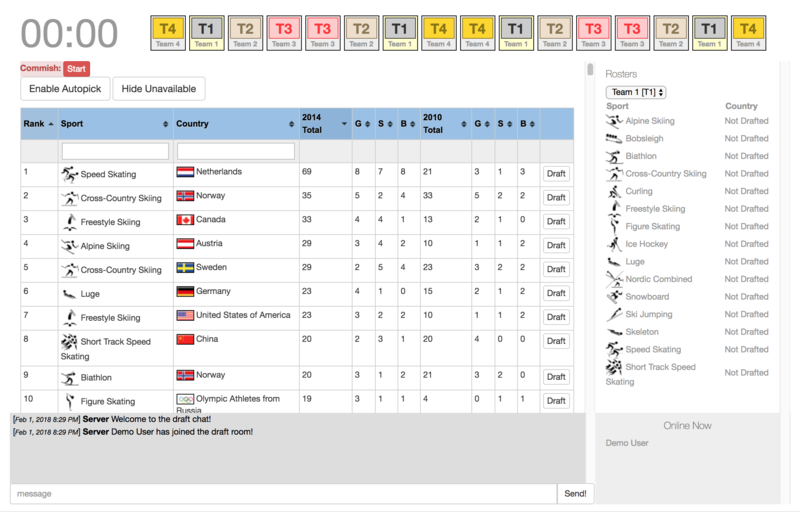 You're able to search for specific sports / countries by using the fields above those columns. For gold leagues, you can search the 1500+ athletes using a search box. if you'd like to draft an athlete that we don't have in our database yet, there's a "Writein" button where you can add folks we're missing. "Team 1" is also this league's commissioner and has the ability to start the draft. When it's your turn, the "Draft" buttons will become active and you can select your country! Selected countries are displayed with a line through them. Also, once you've selected a country in a sport, the other countries for that sport will be displayed as unavailable. You can show / hide these selections with the "Hide Unavailable" button along the top. If the timer runs out and you haven't selected a country, autopick will be enabled and the app will select a country for you. Click the "Disable Autopick" button to turn it back off. Selections (and draft actions, and your league's chat) will appear in the chatbox at the bottom of the screen. If you have any questions or feedback, please contact us!